You are here: Home / Eating Well / Are carbohydrates trying to kill you? Last week, a major study came out apparently calling into question current advice about carbohydrate and fat recommendations. The Internet and media organisations went into meltdown with claims that too many carbohydrates could be sending you to an early grave. Scrolling past the headlines (and actually reading the paper) gave a healthy dose of boring because what makes for a healthy diet has changed little. Called the PURE (Prospective Urban Rural Epidemiology) study, this was a very large observational study looking at the link between fat and carbohydrate consumption and longevity in 18 countries across 5 continents. Running for 7 years and involving over 135,000 people, this was a very big study so its conclusions are right to take notice of. The key finding from the work that attracted the most media attention was that a high carbohydrate diet was linked with a higher risk of earlier mortality, whereas total fat and individual types of fat were related to a lower risk of earlier mortality. Digging deeper into the study, the research team found that global diets consisted of 61 percent energy coming from carbohydrates and 24 percent energy from fats. And while those in the highest carbohydrate consumption group (a whopping 77 percent of energy) had a higher risk of earlier death, it wasn’t cardiovascular disease they were dying from. What those other causes of death were exactly is unclear. Perhaps getting hit by a car running for a Mars Bar was one of them as a recent commenter on my Facebook page theorised. Does this study turn on its head ‘everything we knew about nutrition?’ Not quite. And here’s why. Before the PURE study, there were many studies showing the opposite link between carbohydrates and longevity. So, when a conflicting study comes along, this grabs the media spotlight for the day. Here is just one example – a major systematic review and meta-analysis from 2013 involving 17 individual studies and over 242,000 people showing a higher risk of earlier mortality as carbohydrate intake decreased. And this is the problem at times with observational research in that two studies can give polar opposite results so the findings of the PURE study should be seen through this filter. I’m not going to pick apart the PURE study for its flaws. Such issues are consistent across all observational studies no matter if the conclusions support consensus views or not. What is of value to look at is the positive messages the study gave and how when you look at the full research field, it takes you back to some pretty sensible advice. A key shift in dietary habits over the last few decades has been towards an increase in consumption of highly refined carbohydrates and sugar which is at odds with what dietary guidelines actually recommend. It is possible that the PURE Study was detecting some of that change. Without knowing the overall diet quality of the participants, it is difficult to make firm conclusions. In Australia, we sit at 43.5 percent energy from carbohydrate. We’re hardly killing ourselves slowly with a high carbohydrate diet at that level. But unfortunately, a lot of those carbohydrates are highly refined and we have too much added sugar in our diet. To add to this, only 6 percent of us eat enough vegetables each day. The PURE study is interesting though as it shows how complex it is in determining the role of nutrition over many decades in improving health and simple measures of fat or carbohydrate quantity lose sight of the foods that are part of this. We eat foods, not nutrients, and as nutrition science advances, research is now turning to dietary patterns as being key predictors of health, rather than fixating on percentage targets for macronutrients. Nutrition science is messy. It is a young science and we have to deal with making conclusions from often imprecise research using well below par tools to measure dietary intake. Here’s an example following of individual research studies that have been linked to either increasing or decreasing the risk of cancer. 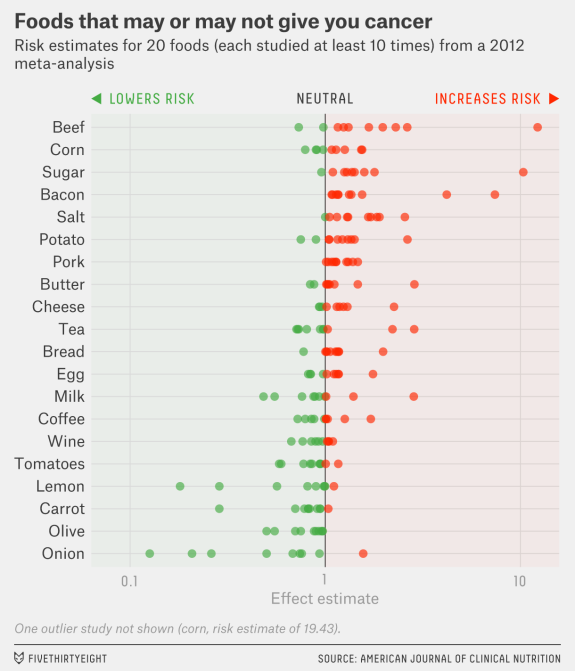 Green dots are good and show that the food lowers the risk; red dots are bad. 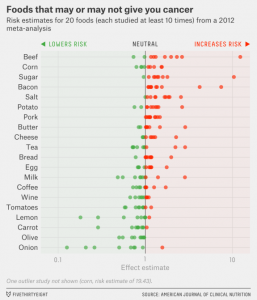 Being selective in what dots you looked at and the studies you cite, red meat can lower your risk of cancer, but if you have it with onions, up goes your cancer risk! Nutrition science is messy because it is impractical to run long-term, high-compliance randomised controlled trials (considered the ‘gold standard’) to answer big health questions. Good luck trying to get thousands of people to adhere to a particular type of diet for years on end – most people struggle for a week or two following a prescribed diet. So, we turn to the next best source of evidence and that’s observational studies. The PURE study is an example of an observational study. Conflict of interest is also a problem. And I do not just mean ‘big food’ funding research. Researchers tied to a particular narrative with their research program (and maybe a large public and media following and the odd best-selling book or two) may find it difficult to do an about face when conflicting evidence presents itself. As humans, we are all susceptible to this. The scientific method helps reduce it, but it cannot eliminate it entirely. Selective use of evidence (called cherry picking) can also be a problem. It has been said that you can build a case for any particular food or nutrient being good or bad for you by quoting a study or two that agrees with you. Just look at what happened when I did just that intentionally in making the case of why broccoli is toxic. But all is not lost. There are recurring themes that we can learn from in nutrition research and these are themes I have seen repeated year after year. There are many paths to good health by eating a range of diets, with the biggest predictor of this being adhering to a dietary pattern that connects with a person, rather than following prescriptive advice. Low fat, high fat and somewhere in between like the Mediterranean diet can only be healthy if food quality of mostly plant-based minimally processed foods is put first. So what are the key nutrition themes seen in healthy dietary patterns around the world? Eat more plant-based foods than animal foods, choose wholegrains over refined grains, limit red and processed meat and choose other beverages in preference to soft drink. And watch how much added sugar is creeping into your diet. Such recommendations may not get media attention like the PURE study, or help sell books in numbers like the latest popular diet, but they are the cornerstone of long-term good health. Studies of eating habits of people are very difficult to reach accurate conclusions. There are too many variables. From personal experience of nearly 3 years of eating just meat, mainly beef and drinking water, and an occasional black coffee – zero carbs, I find I have never felt stronger or more mentally alert. I also got rid of long term excess weight. Blood tests are excellent as is blood pressure. No more arthritis or stiffness. What I like most about my eating is that I have absolutely no cravings for the carb loaded food I used to love and craved for. Plus I enjoy every mouthful of meat I eat while eating and then forget about food for hours until I need more meat. I decided to try it for a month, thinking I wouldn’t die in that time. The first 5 or so days I felt tired and had flu like symptoms (called carb flu) but by 14 days I felt so good that I decided this was a life time choice for me, I am over 70. My only regret is that I did not do this 30 or more years ago. Thanks Tim for a well-reasoned and informative article. It is not valid to judge diets based on macronutrients without looking at the foods that provided them. As others have noted, lentils and lollipops will both show up as ‘carbohydrates’ but have no other commonality. Dr John McDougall, google him and you will find your asnwers for carbs. It is all about balance. Carbs are not bad. It is the type of carbs being constantly eaten which as a population needs to be assessed. Over processed, sugar-laden. Also, wasn’t the higher mortality rates in the PURE study shown to be in developing countries such as Africa, areas of China and South East Asia where the populations are affected greatly by other illnesses and diseases? These populations have higher reliance on carbohydrates such as rice and maize due to availability and low costs in comparison to other food sources. Great rebuttal. Thanks for your educated analysis. A high carb plant based diet for one year put my body into adrenal fatigue. Now eating fats protein and clean carbs feel 100% better. I always enjoy your posts, Informative and interesting for a nutrition newbie like me! I knew there would be articles trying to discredit this study, there’s been quite a few already but you know what.. Speaking from personal experience of living on a 100% plant based high carbohydrate diet, then getting a serious chronic disease which I believe was entirely diet induced to now living long term on a zero carbohydrate diet and just about beating a disease which has never seen a single cured case… I’m just saying carbohydrates aren’t all that. You can make some defence for them all you want but it’s an imagined defence with no basis on truth whatsoever. Dietary recommendations are given at a population level…for specific dietary advice tailored to the individual seek a registered dietitian or nutritionist. This article wasn’t discrediting the study, it was going beyond the sensational headline and putting it into context. All observational studies have flaws (as it explains in the article) and this was no different. As said before, dietary recommendations are a guideline for a population. Even if you are doing well on a 0% carb diet which I find very hard to believe you can avoid ALL carbohydrate, it doesn’t mean it will work for everyone. Luckily we have plenty of dietitians and nutritionists who make recommendations based on scientific evidence and not personal experience. I have a feeling you didn’t read the whole article..